There are about 300 varieties of squirrels around the world. In North America there are ten. Squirrels typically live in trees — in holes in the trunk, or in treetop crow’s nests. The homes in the treetops are called dreys and sometimes consist of two rooms and a nursery! During their first seven weeks they will nurse milk, and then they will eat nuts, acorns, wheat, fruit, bird’s eggs, and mushrooms. Sometimes they will also eat leaves, berries, seeds, oak buds, and corn as well as insects, moths, bird eggs and nestling birds. All rodents gnaw. 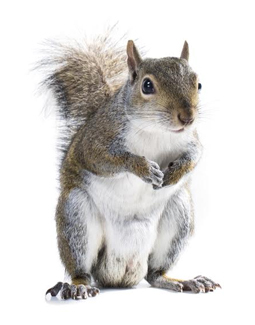 Gray squirrels cause damage just by their chewing. They will chew into attics, and, once inside, can do extensive damage to wiring. They can fall into chimneys and end up in your fireplace, or, if the damper is open, they may end up running around your house. Normally, you will hear gray squirrels up inside the attic, or running in the sofets in the early morning, and, again, later in the day. They are generally quiet at night. If you suspect a squirrel control, trapping, removal, prevention,call Shumaker’s animal control 443-854-8072 immediately for an inspection, before any further damage is done to your home or wiring. Our squirrel removal process is a sure fix to a serious problem. Red squirrels, and flying Squirrels will be heard scampering around at night. Red Squirrels are more prevalent around conifer (evergreen) trees, whereas you generally find gray squirrels around hardwoods. Both red squirrels and gray squirrels prefer to enter your house from a tree that is close enough to gain access to the roof, but sometimes they will climb a deck or a porch to gain entry to the house, or cross a utility wire. Chipmunks generally enter from ground level. Chipmunks (our species is the Eastern chipmunk) are also known as ground squirrels. We remove all squirrels with cage traps, then the entry holes are sealed up to prevent new infestations. This is the only method I use. After all of the squirrels are gone,we permanently patch the openings with wire and appropriate materials, and remove all nesting material, finally we disinfect the area to kill any parasites left.